If you’ve ever watched a commercial of a beautiful blonde slipping off her jewelry as she saunters through her home then you’re probably watched a Dior commercial. 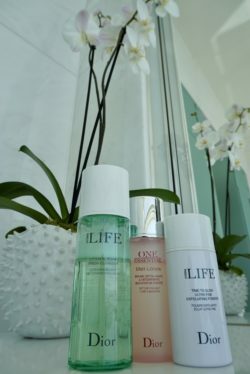 When Charlize Theron says “J’adore Dior,” I reply, “Yes, I love Dior!” And, in particular, I love Dior Hydra Life when it comes to taking care of my skin. So while most might start their mornings with a cup of coffee, my mornings start with my Dior Hydra Life skin regimen. Actually, my morning skin routine begins the night before. Because really, who shows up to a performance without preparing first? That’s why I end my night with a Dior Hydra Life Jelly Sleeping Mask. This mask hydrates my skin so I can wake up the next day with smoother and softer skin. After resting for a few hours, I’m ready to start with a fresh palette. I start off my morning with the “Time to Glow – Ultra Fine Exfoliating Powder.” Not only does it work to buff away the problems of yesterday, but it also leaves my skin bare and ready to absorb my army of Dior skincare. Now that I’ve given my skin “time to glow,” it’s time to cleanse. A huge staple in my morning routine is the Dior Hydra Life “Lotion to Foam – Fresh Cleanser. Packed with a long list of benefits, this product helps combat all the unwanted blemishes and blackheads that might appear on my skin in the morning. A gentle but effective product, this Dior cleanser speaks true to its name, leaving my face fresh and radiant. My life is often fast-paced and I don’t always have time to spend a few minutes dedicated to buffing a cleanser into my skin. For this reason, I’m sure Dior made this next product with me in mind. The Dior “One Essential – Mist-Lotion Detoxifying Mist Purity Booster” is an easy favorite. With a quick press of the nozzle, my skin is quickly cleansed and the fine mist is instantly refreshing, especially in the early hours of my day. Staying young and feeling young often have everything to do with “looking young.” A clear face and supple skin are obvious ways to achieving this and I achieve this with the Dior Hydra Life “Extra Plump – Smooth Balm Mask.” This final product in my morning routine is modeled after its name. It helps smooth the skin while plumping it and preparing it for the start of my day. I run a busy schedule, so I don’t often have the time to check and see if a blemish has appeared or whether I look as awake as I did 10 hours ago. Thankfully with these Dior products as staples in my morning routine, I don’t have to worry.